Topics: Gallery, Conservatories, Glazing Services, Emergency Repairs, and Double Glazed Units. 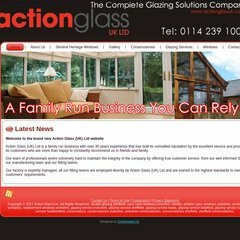 actionglassuk.co.uk Replacement double glazing | upvc windows Yorkshire, Derbyshire .. The programming language environment is PHP/5.2.10. It has 2 DNS records, ns2.turbodns.co.uk, and ns1.turbodns.co.uk.